These vintage gold key bottle openers are ideal 50th wedding anniversary favors and make great guest gifts for housewarming parties. The key to health, the key to happiness...a key can represent opening doors to new adventures and more. 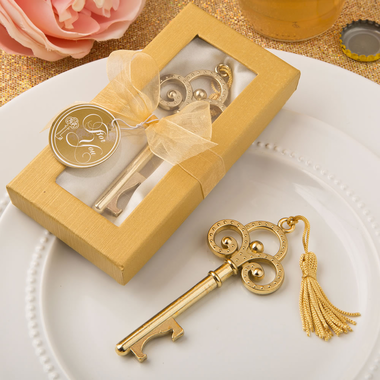 Made from metal and painted a polished gold, this skeleton style key is topped with a golden tassel. And most importantly it opens bottles - a useful function indeed! Each measures 4" X 1.5" and comes packaged in a box tied with a ribbon and a matching "For You" tag attached.